Albert Stark (Seth MacFarlane) is a sheep farmer (who isn’t very good at keeping his livestock contained) who hates living on the frontier. There are too many things that can kill you. He often laments the lifestyle with his friend, Edward (Giovanni Ribisi). Albert is set on winning back his ex, Louise (Amanda Seyfried) from her new beau, the mustachioed Foy (Neil Patrick Harris). When Anna (Charlize Theron) comes to town, she and Albert quickly become friends as she helps prepare him for a gunfight with Foy. It isn’t until Albert really develops feelings for Anna that he finds out she is the wife of notorious gunslinger Clinch Leatherwood (Liam Neeson). Clinch is very much the jealous type, and looks to find out who has stolen his wife and exact his revenge. Feeling betrayed, and hoping to avoid being killed by Clinch, Albert plans to leave town. 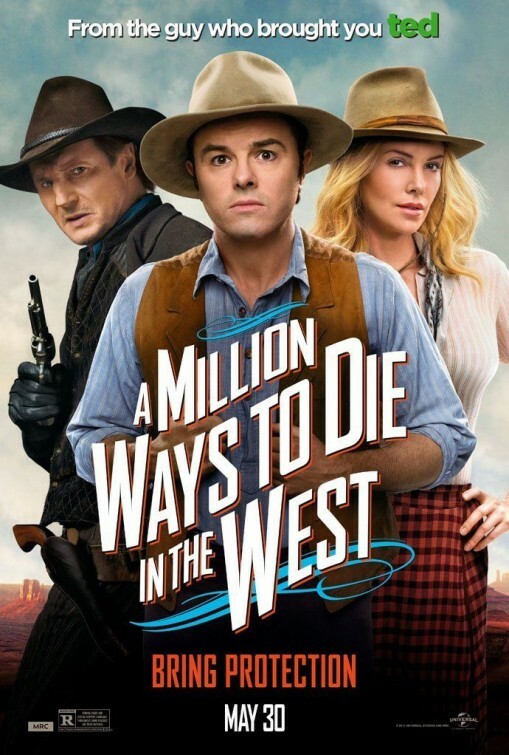 Written, directed and produced by Seth MacFarlane, A Million Ways to Die in the West seems a chance for Seth to be a little self-indulgent. Although it is set in the wild west of the 1880s, the way the characters act and talk feels like it would be better suited if it were set in the present. But then you would lose the heart of the story. The fear of everything that can kill you in the wild west. Although it seizes the opportunity to showcase several different gratuitous deaths from “natural causes,” I really expected to see more of these, given the title. The story takes what is standard fare for westerns and presents it with an outside, modern take on the situation. At times, it almost feels as if Seth and crew are making it up as they go along. “Here’s the gist of the story. Now do something funny.” With the cast we are given, it could have worked. Instead, we are given Giovanni Ribisi and Sarah Silverman, with their over the top styles, and Charlize Theron and Liam Neeson, who take on slightly more serious roles, and make them conform to MacFarlane’s comedic stylings. And, sadly, it falls flat. Not even Neil Patrick Harris could save this movie. As for the production quality, most of the time, it feels as if the acting is done entirely in front of a green screen. Everything feels two-dimensional. The only thing that doesn’t feel flat are the poorly CGI’ed death scenes. Sure, there are some funny parts. I will admit I laughed here and there. But nothing like what it could have or should have been. Granted, I’m not a huge Seth MacFarlane fan. Perhaps I was a bit jaded having heard less than stellar reviews before having seen it. Either way, A Million Ways to Die in the West is one of those films that you won’t hate yourself for missing. And you won’t really hate yourself for watching. If you are an avid watcher of Family Guy or American Dad!, this movie is probably right up your alley. Wish it was funnier. Also, wish it didn’t just rely on the same jokes to hit, time and time again. Good review Bailey. Thanks! It didnt nearly live up to the hype. And you’re right. The jokes got old pretty quickly.